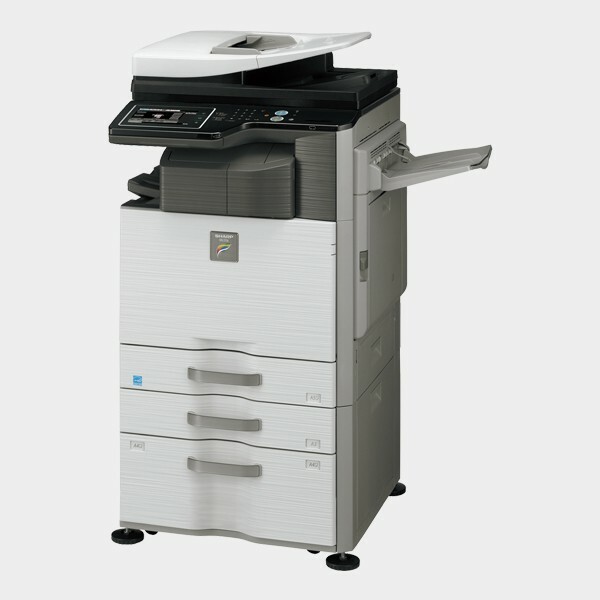 The MX-M354N A3 black & white MFP is designed to bring power, performance and productivity to any busy workgroup. In addition to all the high quality network printing and copying functions central to any office workflow, every major feature is supplied as standard. An integrated 100-sheets document feeder (RSPF) lets you scan full colour documents as quickly as 50 originals per minute, a built-in stackless duplex module allows you to easily print on both sides of the paper, plus a wide range of options can be added to ensure you can have the correct features to meet your needs, whether it is faxing, enhanced security features, additional paper supply or finishing. The innovative inner finisher option provides automatic sorting, stapling and offset stacking capabilities without the need for an external finishing unit. The MX-M354N is easy to use with its 7.0 inch LCD panel and optional keyboard and the powerful network utility software makes it easy to manage too. The MX-M354N has been designed with the environment in mind, offering Auto Power Shut Off mode and complying with the latest Energy Star regulations.